Explore a globally-unique collection of venomous snakes and lizards, while also making exciting discoveries within areas such as technology, physics, chemistry and medicine. The reptile collection at Universeum is globally unique. Many of the snakes are some of the most venomous creatures on earth, but also some of the most endangered and rare species. In the Reptilarium you can get up close to reptiles that are loved by many, feared by others and essential to everyone. The venom is produced in glands in the lower jaw and when the Gila bites, their powerful jaws chew the venom in through capillary action along the grooves in their teeth. Is considered to be the world’s most venomous snake – and rightly so. A single bite from the inland taipan contains enough venom to kill over 30 adults! It is so hard to find that the locals call it “the ghost of Costa Rica’s forests”. This snake is very dangerous on account of it being aggressive, venomous and capable of delivering a large quantity of venom when it strikes. The king cobra is the world’s longest venomous snake. It can grow almost six metres long! The scientific name for the king cobra is Ophiophagus, which means “snake eater” – the king cobra prefers to eat other snakes. The Mangshan pit viper is also known as “the green dragon”. It’s an endangered species and there are only 300–500 specimens left in the wild. The biggest threat against it is that its natural habitat is being destroyed, and Mangshan pit vipers only inhabit a very small area. The scientific name parviocula means “small-eyed”. According to one story, the first snake that was found had been run over by a car, causing its head to look flat and large and the eyes small. But the eyes aren’t smaller than normal. The common death adder is a hunter who hides among leaves and bushes. Thanks to its camouflage, it blends perfectly into its surroundings. To lure its prey into striking range, the death adder uses its tail as bait. The wriggling tip of the tail looks like a caterpillar. The Santa Catalina rattlesnake is a rattlesnake without a rattle! Why this snake has lost its rattle over time, no one knows. The snake is endemic to the island of Santa Catalina in the Gulf of California, where it has no natural enemies. 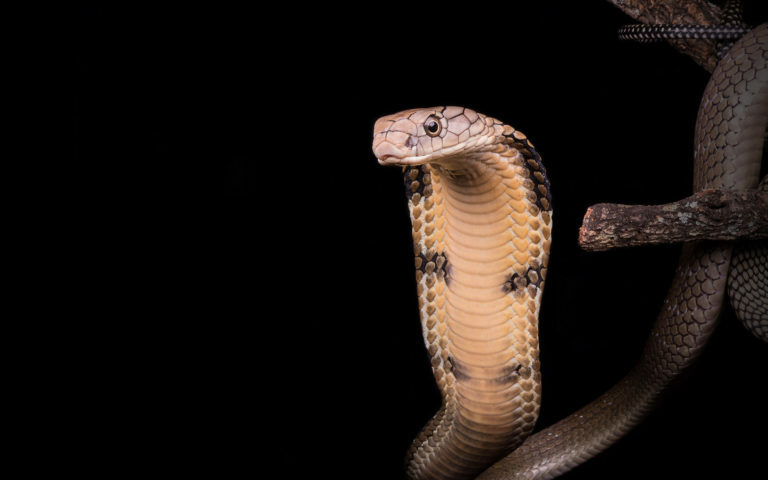 When this snake feels threatened it emits a loud hiss and twists its body violently. Sometimes it can strike with such force that the entire body is lifted off the ground. The Sri Lankan pit viper is endemic to Sri Lanka, which means that it has evolved there and can only be found there. During the day, it rests in the treetops where the sun’s rays keep it warm. Occasionally it climbs down at night to hunt. This snake is used in traditional medicine. It is dried and grounded into a powder which is used for many ailments and illnesses. Unfortunately, the hunt for this snake for medicinal use has made the snake increasingly rare.